The bonsai tree is a miniature, woody tree that comes in many variations and hybrids. The bonsai is, in fact, a normal tree that is kept in small form through trimming and pruning. Though many variations and species of the bonsai exist, the care and cultivation of the various types of bonsai are similar. Provide your bonsai tree with direct sunlight. Most bonsai variations require at least six to eight hours of direct sunlight each day. This sunlight can be indoors or outdoors. However, some bonsai variations require shade and shelter, such as the Japanese Maple Bonsai and the Sago Palm Bonsai. Pay close attention to your variation’s requirements. Water your bonsai regularly and at the same time each day. Bonsai trees require timely watering to maintain soil moisture. These trees generally require watering every day or every other day. However, the amount and frequency of watering should be determined by observing the specific tree. The bonsai’s pot or planting area should be well-irrigated, as excessive water can have adverse effects on the bonsai tree. Fertilize your bonsai sparingly. Avoid high-nitrogen fertilizers and choose water-soluble options that feed and fertilize. Bonsai trees that are ill or have very dry soil should not be fertilized. Water your ill and dry bonsai and nurse it back to health first. Once the plant shows signs of improved health, fertilize the tree in small amounts. Avoid placing the fertilizer directly onto the tree’s trunk, as it could suffer fertilizer burn. Prune your bonsai regularly to shape the tree and keep it miniature. 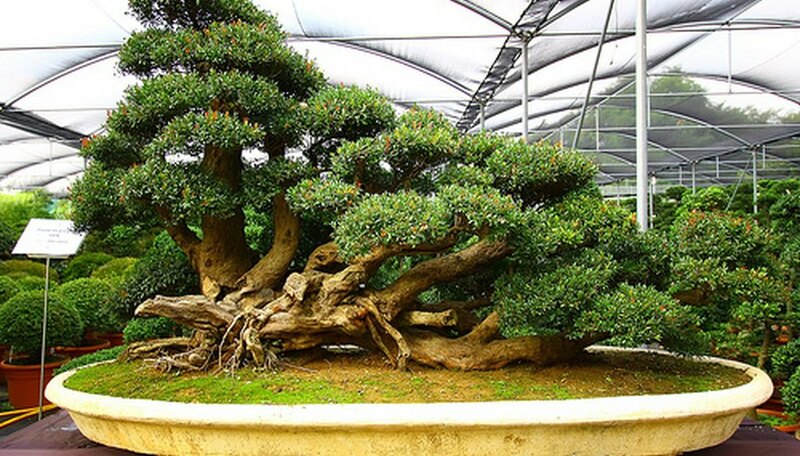 The bonsai’s limbs, as well as its roots are trimmed to maintain its miniature size. Avoid trimming large amounts of new growth simultaneously as this could stunt the tree’s overall growth. Shape your tree by wiring the branches into the direction that you wish it to grow. It is general practice to leave the wires in place for six months, at which time the tree will take to its new shape. Transplant your bonsai tree every three years. The repotting process provides bonsais with fresh, fertile soil and more space for its roots. Though the bonsai is a miniature tree, the roots of the bonsai require ever increasing space to maintain the tree’s health. This is especially important with blooming bonsais. Bonsai roots are susceptible to drying. Do not water or fertilize your bonsai immediately after repotting.